NEBRASKAland Magazine/Nebraska Game and Parks Commission. Song is loud trilling, rising or falling at the end. Description: Yellow rump; yellow patch on side; yellow crown patch; white eye ring and tail spots; dark gray above with black streaks; black breast band; and white belly. 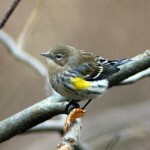 In northern and eastern race (“Myrtle Warbler”) note white eyebrow; white throat and sides of neck; and contrasting black cheek patch. Western race (Audubon’s Warbler”) has yellow throat, and lacks black cheek patch. Females are duller than males. 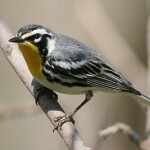 Widespread in wooded habitats during migration. 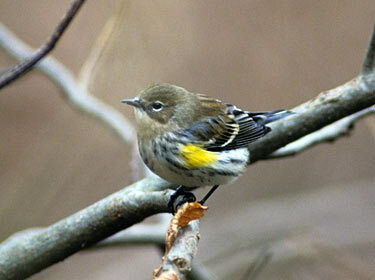 Habitat: Breeding birds found in coniferous forests, nesting in scattered trees and streamside thickets. Avoids nesting in dense, mature forests. 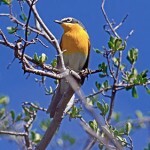 Where in Nebraska: Common to abundant spring and fall migrant across the state. Summer resident in Pine Ridge area. Rare winter visitor or resident in southeast, particularly during mild winters. Fun Facts: Diverse array of foraging behaviors like clinging to the bark surface to look for hidden insects, frequently sit on exposed branches and catch passing insects like a flycatcher does. Will also eat fruit and have even been seed eating seeds at bird feeders.